Naza Premira Sdn Bhd, the official local distributor of Vespa, said the models were available for viewing from this month at selected authorised Vespa dealerships and outlets nationwide. “Expressing uniqueness and a distinctive lifestyle, Vespa is the ultimate symbol of Italian elegance and its scooters are designed for those who appreciate the true meaning of life with the brand interpretation ‘Not for Everyone’. “Infused with style, comfort, safety and sturdiness, the Vespa 946 (RED), Sprint Carbon and Sei Giorni are unrivalled in today’s scooter market,” the company said in a statement today. Naza said the the Vespa 946, available only in red, was an exclusive model dedicated to aesthetic and technological perfection. “An all-red version of the classic Vespa 946 scooter, it has a style and cutting-edge technology that will rewrite the future while evoking memories of the inspiration and creativity of the original idea behind the Vespa. “As per Vespa tradition, it dons a steel bodywork embellished with eye-catching aluminium components such as the mudguard and the side covers that houses the engine, transmission and mechanical parts,” it said. Priced at RM66,000, the 150cc eco-friendly scooter also comes with a twin-disc brake system complemented by a dual-channel Anti-lock Brake System (ABS) and Anti-Slip Regulation (ASR) traction control that are exclusive to the Piaggo Group. For those who enjoy riding round town in style and dynamism, Naza said the 150cc Vespa Sprint Carbon was the perfect choice as it was made to heighten riding pleasure and safety while embodying the heritage and tradition of vitality and youthfulness of the legendary Vespino. “A combination of sporty personality and innovative technology, the Vespa Sprint Carbon is the most modern version of the Vespa sport idea. The sporty ‘small body’ scooter is entirely made of steel, characterised by its bold rectangular headlights and large 12-inch wheels with spectacular aluminium alloy rims,” it said. With a starting price of RM17,400 and only available in black, Naza said the Vespa Sprint Carbon also stands out for its generous equipment package which includes a USB socket, located inside the leg shield back plate compartment and comes standard with ABS. Last but not least, the Vespa Sei Giorni is a special version and heir to the original Vespa. Sport “Sei Giorni” specifically built for the taxing “Sei Giorni Internazionale di Varese” regularity competition of 1951 where it won nine gold medals. “The models are produced in numbered edition and dons a ‘Special Edition’ plate on its leg shield back plate bearing its serial number. Its uniqueness is also enhanced by the black number plate taken directly from the livery of the Vespa, highlighted by all black parts and gritty red details,” it said. Naza said the scooter was designed with the characteristic elements such as the “faro basso”; the low position of headlight assembly on the front fender, and the handlebar like the one on the original Vespa Sei Giorni. 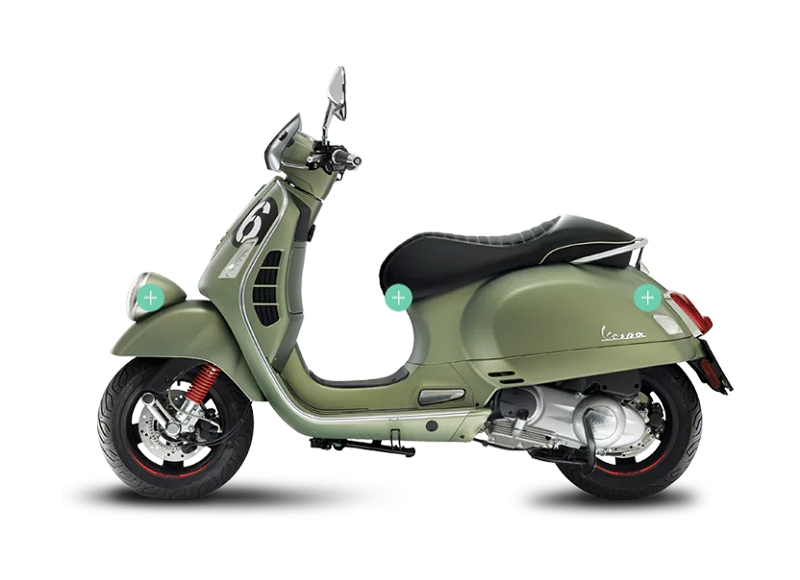 Available in the colour green and priced at RM38,000, the Vespa Sei Giorni also comes with a single-seat look saddle ergonomically crafted to ensure absolute comfort and uses the most powerful engine in the history of Vespa scooters capable of putting out 15.6 kilowatts of power at 7,750 revolutions per minute. “In addition to its standard ABS safety feature, the scooter also has a USB port located inside the compartment of the leg shield and front turn LED lights that function as day running lights,” it added.